While the vast majority of Mediflow water pillow buyers say it is the best pillow they ever slept on, a few do not. Make sure you try various water levels over several nights, even a half a cup of water can make a difference, and follow instructions to remove air from the water chamber. 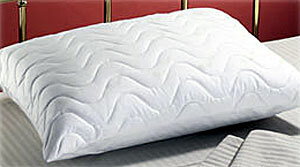 The only cervical pillow with peer-reviewed, published support of effectiveness. The patented Waterbase™ pillow gently adjusts to constantly support the head and neck in optimal posture. Your head floats over a thin layer of water for outstanding comfort, improved sleep quality and reduced neck pain and headaches. When on the back, the Mediflow* waterbase cradles the neck with outstanding support in all directions. As you roll from back to side, the water instantly adjusts to maintain correct head and neck support with outstanding comfort. Fiberfill is also much more comfortable than foam.